One generation retires, another is immediately ready to step into illustrious shoes; the evidence presented on Saturday 24th March at the 2018 Italian Junior and Cadet Open in Lignano suggests that for China the unbroken chain of success will continue into the far distant future. Impressively Xiang Peng and Kuang Li won the Cadet Boys’ Team title, the counterpart Cadet Girls’ Team top prize was secured by Chen Yi and Liang Jiayi; both pairs proved a class apart. A three-nil margin of victory, it was the score-line they had recorded at every stage of the competition. One round earlier they had accounted for Hungary’s Mate Oscar and Erik Huzsvar, having at the quarter-final stage overcome the Singaporean outfit formed by Andy Wong Yan Kai, Nicholas Chang and Donon Soh. Equally in the opposite half of the draw the Italians had been impressive, in the round of the last eight, they had beaten Slovakia’s Adam Klajber and Filip Delincak by three matches to one, prior to recording a three-nil success in opposition to Romania’s Andrei Tomica and Daries Movileanu. Meanwhile, in the Cadet Girls’ Team event the performance extolled by Chen Yi and Liang Jiayi was equally imposing. A three-one win was the verdict in the final against the Russian combination of Elizabet Abraamian and Lubor Tenser; the one errant match was the doubles won by the Russians in three straight games (11-8, 11-9, 11-7). However, wins for Chen Yi against both Lubor Tentser (11-9, 11-9, 11-3) and Elizabet Abraamian (12-10, 7-11, 12-10, 9-11, 11-1) and for Liang Jiayi also in opposition to Elizabet Abraamian (13-11, 11-7, 11-5) reserved the top strep of the podium. 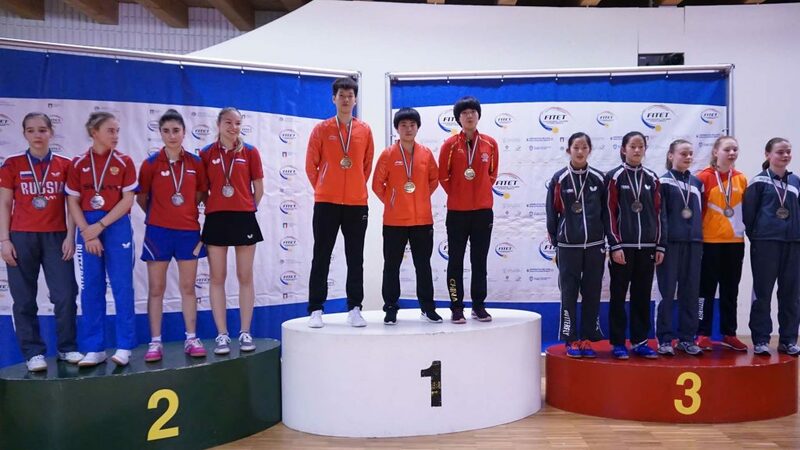 Earlier Chen Yi and Liang Jiayi had beaten the combination of Croatia Hana Arapovic and the Czech Republic’s Linda Zaderov by three matches to nil, prior to in the penultimate round recording the same margin of victory against the United States sisters Joanna Sung and Rachel Sung. Convincing performances, it was the same from Elizabet Abraamian and Lubor Tenser. They secured a three-nil last eight win over Romania’s Elena Zaharia and Luciana Mirofan before repeating the success at the semi-final stage in opposition to Lithuania’s Emilija Riliskyte and Kornelija Riliskyte. Proceedings in the Cadet Boys’ Team and Cadet Girls’ Team events concluded; attention now turns to the individual events in the same age group as well as in the Hopes category. Play concludes on Sunday 25th March.